There are so many types of Yu-Gi-Oh trading card game tournaments that people of all ages can participate in today. From regional tournaments to mall-based ones, all you really have to do is select the tournament you want to join! However, if this is your first time to join any Yugioh tournament, then you just might want to know a thing or two before entering any of them. This way, you would have a glimpse of what to expect, and you would be better prepared for anything that comes your way. Preparation is the key when it comes to joining such tournaments. There are some wherein you would be required to bring your own deck of Yu-Gi-Oh cards. Others would have you constructing your own deck at the place of the event itself. Just to be on the safe side, it would be better to have your own deck handy. A tournament is comprised of structured matches that would pit you against opponents that have been predetermined. Often times, there is an entry fee that you would have to pay, but usually this is negligible. And of course you should consider the many prizes and the prestige entailed if you win any of these tournaments. Take the Duelist King tournaments, for instance. This tournament has been part of the circuit for a long time now, and remains such a favorite among Yu-Gi-Oh enthusiasts. Duelist King Tournaments usually take place in league locations, and even in local card stores you can find in your local area. The players of this type of Yugioh tournament are known as Duelists, and the prizes that are at stake here include store credit, tournament packs, booster packs, and prestigious trophies. Another type of tournament you might be interested in is the Regional. At stake are ranking points for the tournament, as well as product prizes. What’s more, the resulting Top 4 players would be given the much awaited chance to take part in the Yugioh National Championship Tournament. Likewise, the resulting Top 4 players at the Nationals will then move on to the Yu-Gi-Oh World Championship Tournament, wherein the title of World Champion is at stake! Now, this is definitely a long way to go from the Regionals! If you are interested in joining these tournaments, you can then go ahead and register online! Or, you can drop by your local card retailers. They can give you all the information you need too. Currently (as of 2012) there are local events at Official Konami Tournament Stores, next is the Yu-Gi-Oh! 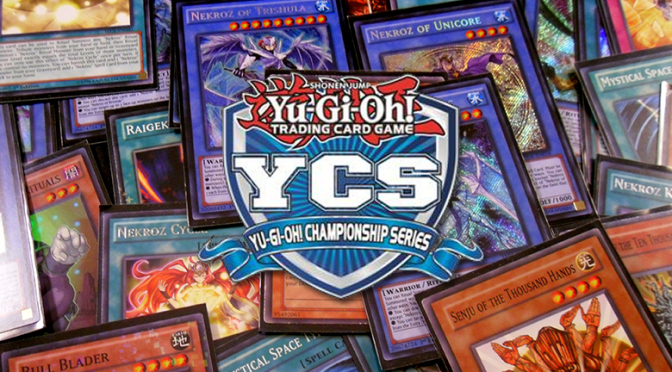 Championship Series (YCS) tournaments ehich are the largest non-invite tournaments and can span 2-days, taking place from Saturday to Sunday. Thousands of Duelists from all over attend these events to compete for exclusive prizes, earn invites to their World Championship Qualifier, and spend the weekend Dueling, trading, and hanging out with hundreds of other Yu-Gi-Oh! fans. Then there are Regional Qualifiers which are high-level tournaments in which Duelists compete to earn invites to their World Championship Qualifiers, along with exclusive prizes! Finally there is the World Championship, held once a year in various locations worldwide. Now that you are ready to play in a tournament, you should get yourself some Rare Yu-Gi-Oh Single Cards (Click Here! Always on Sale!) to help you beat your opponents. If you need a Yu-Gi-Oh Starter deck, you can get one of those there too. The rare Yu-Gi-Oh cards are so-named because of their being powerful and also limited in numbers released. Players opting to get them need to purchase Yugioh singles or booster packs which can be a bit of a gamble because you don’t know what cards you may be getting. Each card belonging to this group has the power to attack and do some defense ratings that will allow the players to overpower the lesser imaginary characters. They are kept in rarity simply for the fact that if they are made common, the game would become unbalanced as everybody can take and use them. Aside from their power, the rare cards possess a number of special abilities. These abilities are what generally set them apart from the other cards in the game. For instance, there is one particular rare card that holds the power to reject two-card piece from the opponent’s hand. Obviously, such types of cards will help a player put Yugioh in his favor. In addition to the attributes they provide in the game, these cards are unique from the rest for certain cosmetic features that make them worthy enough to collect. Typically, they feature gold-colored lettering and holographic foil, among others. The scarcity of each release generally determines their higher value. According to Yugioh experts, getting cards marked with the “First Edition” are more valuable than the others. Speaking of value, the rarity of Yugioh cards are categorized into seven types. That includes rare, super rare, ultra, ultimate, secret, parallel, and finally, ghost rare. Under the first category, the cards are made in silver foil. One of them is present in every pack, excluding the OCG packs. The Super Rare, on the other hand, is printed on holographic foil background, while the Ultra Rare comes with gold foil. The rest are printed either on gold or holographic silver foil. Whichever of the rare Yugioh cards you choose to get, note that each of them possesses a particular ability that can help you win the game. You can easily obtain them if you buy the Yugioh singles, which are now offered in any stores that sell collectible card trading games worldwide.